On the horizon from the left are: Seatallan, Haycock, Red Pike, Scoat Fell, Steeple, Black Crag, Wind Gap, and Pillar. The bottom of the Dore Head screes is exactly in the middle of the picture and they can be traced going diagonally, and then vertically up to Dore Head itself. To the left of Dore Head is the very steep Stirrup Crag ascent to Yewbarrow. 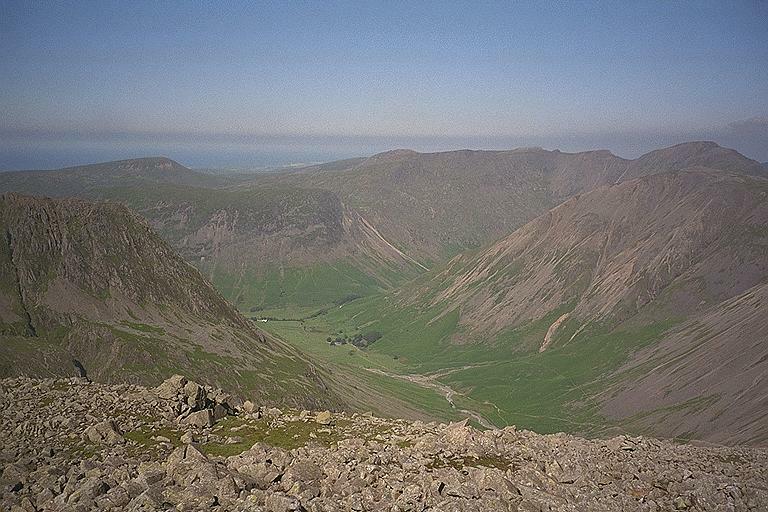 The slopes of Lingmell appear on the left of the picture and the lower slopes of Great Gable on the right. Kirk Fell appears in front of Pillar. Lingmell Beck can be seen in the valley below with Gable Beck running into it from the right. The ravine of Ill Gill, which runs down into Gable Beck from Kirk Fell, is very clear. Smaller version of this picture.